Master of Fine Arts candidate Kench Lott challenges depth and understanding with steel sculptures in his upcoming exhibition “Mindful Escapism.” The exhibition will be on view from Nov. 5 through 30 at the Center for Art and Theatre’s University Gallery on the Georgia Southern University Statesboro Campus. A public reception will be Friday, Nov. 30 from 5 to 7 p.m. at the gallery. One of Lott’s steel sculptures. 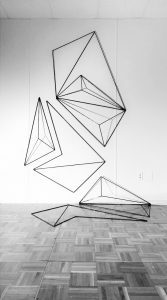 Lott creates visual paradoxes to generate a mindful form of escapism by working with basic materials such as hollow steel piping and solid steel rods. Lott’s intent with his works is to divert the viewer’s attention away from the distractions of society by challenging their understanding of space and depth. Jason Hoelscher, the Betty Foy Sanders Department of Art gallery director in Statesboro, said Lott does a great job of commanding a space with a minimalistic approach.